John Madden will never forget the first day he saw Henry Lawrence. It’s a reason he is an NFL Hall of Fame coach and Lawrence went on to win three Super Bowls. Then the head coach of the Oakland Raiders, Madden was at the 1974 Senior Bowl to check out Ed “Too Tall” Jones, a heralded defensive lineman who would become the number one pick in that year’s NFL draft. Madden saw what others didn’t. He was more impressed how Lawrence blocked Jones and kept him under check during the Senior Bowl practices. 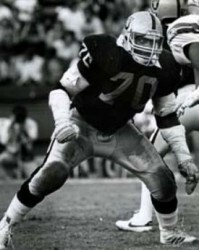 The Raiders drafted Lawrence with their first pick (19th overall) and Lawrence went on to have the best NFL career of any player to come out of Manatee County, earning several Pro Bowl honors along with his Super Bowl rings. 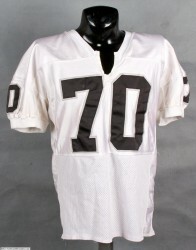 Lawrence had to overcome several obstacles to earn that number one draft pick and earn the starting right tackle spot for the Raiders. He was an All-American at the old Lincoln High in Palmetto, but when he transferred to Manatee High in 1969 under the first year of integration he rarely played for a coaching staff that didn’t know how to deal with a difficult situation. Today, most folks who follow local sports will tell you Lawrence’s benching at Manatee was the biggest coaching blunder in the history of Manatee County sports. It cost Lawrence in the pocketbook. Instead of going to a major college program he had to settle for FAMU when the big college programs that were courting him backed off. After getting drafted, Raiders owner Al Davis used that against Lawrence telling him players coming from small black schools didn’t get as much money as other draftees. The two Raiders picked after Lawrence that year, tight end Dave Casper (Notre Dame) and running back Mark van Eeghen (Colgate) got more money, Lawrence said. Despite being an All-Pro caliber player during his 14 years in the NFL, Lawrence’s best pay check was $350,000, a pittance compared to what present day players earn. “The attitude then was if you came from a small black college you weren’t ready for the NFL and needed more coaching and that affected your contract,” Lawrence said. As with many long time NFL players, Lawrence paid a heavy price for his long career. He says not a day goes by when some physical ailment reminds him of his days in the trenches. “I hurt all the time depending on what day it is,” Lawrence said. “One day it might be my knees, or an ankle, foot or back and then my head. When I played I had a couple of concussions and had my bell rung a few times. Back then they gave you smelling salts and put you back in the game. I have a lot of headaches these days.” Lawrence has always been a fighter for justice even in that tumultuous year at Manatee High in 1969 when tensions were high and a riot closed the school for a few days. He always fought to establish peace looking for justice over taking a side because of race in those stormy days. Today, Lawrence’s heart is with the NFL players of his era. He feels they have not been treated correctly and blames some of it on the late Gene Upshaw, his teammate with the Raiders and former president of the NFL Players Union. “I played with Upshaw and he was like a brother to me. I don’t know what happened with him. Somewhere along the line he got caught up with his power,” Lawrence said. “I go to meetings today with former NFL players and see the older guys walking with canes and rollers and half can’t get up without any assistance. Guys are in wheelchairs and get turned down for benefits. Lawrence spends these days speaking at prisons to help troubled youth and does a lot of singing engagements, sometimes with his Henry Lawrence Band. Every year he sings with the NFL Gospel choir prior to the Super Bowl and will be in Indianapolis this year for the game. Though he and Al Davis went through quite a few contentious contract negotiations, Lawrencewent to his funeral and sang the national anthem at the Raiders game with Cleveland this past season after Davis died. Lawrence played his entire NFL career with the Raiders (from 1974-1986) and Davis was the owner and general manager during the entire period.